The Vanderbilt Grace is a landmark hotel nestled in the middle of downtown Newport, up a cobblestone hill. I’m sure the hotel itself is lovely but all we really cared about were the oysters. We had lunch in the sun room, which was quiet, warm, and relaxing – the perfect place for a little celebration. The hostess gave us ample time to review the drink menu, ask questions, and generally sink into our seats. And then a new waitress manically dumped a basket of bread on our table, pointed at Dave, and insisted several times that he’d eaten there before. Crazy was carted away. Too much energy for the Vanderbilt. 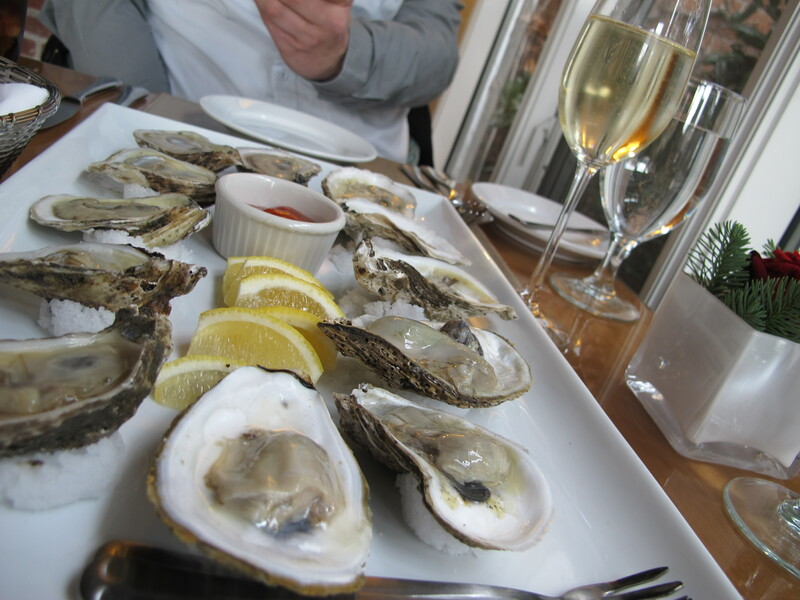 The oysters were beautifully presented. The bison burger was beautifully presented. The crab cake was topped with butternut squash relish, and thus beautifully presented. I had a glass of champagne. It was all we could do not to nap on the table by the end of our meal, but then we ordered dessert and Crazy returned, shouting just one word: “DESSERT!” before leaving our (phenomenal – and beautifully presented) pound cake and bouncing away. Hi there – thanks for this review, we’re delighted you enjoyed your meal at Vanderbilt Grace!